Carpal tunnel syndrome (CTS) is a collection of characteristic symptoms and signs that occurs following compression of the median nerve within the carpal tunnel. Usual symptoms include numbness, paresthesias, and pain in the median nerve distribution. These symptoms may or may not be accompanied by objective changes in sensation and strength of median-innervated structures in the hand. [1, 2] See image below. 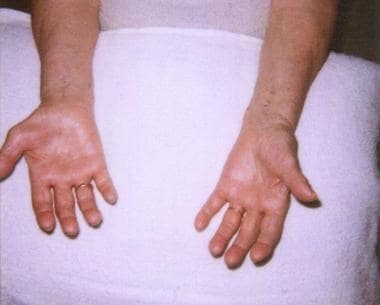 The hands of an 80-year-old woman with a several-year history of numbness and weakness are shown in this photo. Note severe thenar muscle (abductor pollicis brevis, opponens pollicis) wasting of the right hand, with preservation of hypothenar eminence. Electrophysiologic studies, [3, 4, 5] including electromyography (EMG) and nerve conductions studies (NCS), are the first-line investigations in suggested carpal tunnel syndrome (CTS). Abnormalities on electrophysiologic testing, in association with specific symptoms and signs, are considered the criterion standard for CTS diagnosis. In addition, other neurologic diagnoses can be excluded with these test results. Electrophysiologic testing also can provide an accurate assessment of how severe the damage to the nerve is, thereby directing management and providing objective criteria for the determination of prognosis. Magnetic resonance imaging (MRI) of the carpal tunnel is particularly useful preoperatively if a space-occupying lesion in the carpal tunnel is suggested. Until the advent of electrophysiologic testing in the 1940s, carpal tunnel syndrome (CTS) commonly was thought to be the result of compression of the brachial plexus by cervical ribs and other structures in the anterior neck region. It is now known that the median nerve is damaged within the rigid confines of the carpal tunnel, initially undergoing demyelination followed by axonal degeneration. Sensory fibers often are affected first, followed by motor fibers. Autonomic nerve fibers carried in the median nerve also may be affected. The cause of the damage is subject to some debate; however, it seems likely that abnormally high carpal tunnel pressures exist in patients with CTS. This pressure causes obstruction to venous outflow, back pressure, edema formation, and ultimately, ischemia in the nerve. The risk of development of CTS appears to be associated, at least in part, with a number of different epidemiologic factors, including genetic, medical, social, vocational, avocational, and demographic. A complex interaction probably exists between some or all these factors, eventually leading to the development of CTS. Definite causative factors, however, are far from clear. The incidence of carpal tunnel syndrome is 1-3 cases per 1000 subjects per year; prevalence is approximately 50 cases per 1000 subjects in the general population. Incidence may rise as high as 150 cases per 1000 subjects per year, with prevalence rates greater than 500 cases per 1000 subjects in certain high-risk groups. A paucity of population-based studies of carpal tunnel syndrome (CTS) exists; however, the incidence and prevalence in developed countries seems similar to the United States (eg, incidence in the Netherlands is approximately 2.5 cases per 1000 subjects per year; prevalence in the United Kingdom is 70-160 cases per 1000 subjects). [21, 22, 23] CTS is almost unheard of in some developing countries (eg, among nonwhite South Africans). Carpal tunnel syndrome is not fatal, but it can lead to complete, irreversible median nerve damage, with consequent severe loss of hand function, if left untreated. The female-to-male ratio for carpal tunnel syndrome is 3-10:1. The peak age range for development of carpal tunnel syndrome (CTS) is 45-60 years. Only 10% of patients with CTS are younger than 31 years. Chammas M, Boretto J, Burmann LM, Ramos RM, Dos Santos Neto FC, Silva JB. Carpal tunnel syndrome - Part I (anatomy, physiology, etiology and diagnosis). Rev Bras Ortop. 2014 Sep-Oct. 49 (5):429-36. [Medline]. [Full Text]. Chammas M, Boretto J, Burmann LM, Ramos RM, Neto FS, Silva JB. Carpal tunnel syndrome - Part II (treatment). Rev Bras Ortop. 2014 Sep-Oct. 49 (5):437-45. [Medline]. [Full Text]. Robinson LR. Electrodiagnosis of carpal tunnel syndrome. Phys Med Rehabil Clin N Am. 2007 Nov. 18(4):733-46, vi. [Medline]. Practice parameter for electrodiagnostic studies in carpal tunnel syndrome: summary statement. American Association of Electrodiagnostic Medicine, American Academy of Neurology, American Academy of Physical Medicine and Rehabilitation. Muscle Nerve. 1993 Dec. 16(12):1390-1. [Medline]. Stevens JC. AAEM minimonograph #26: the electrodiagnosis of carpal tunnel syndrome. American Association of Electrodiagnostic Medicine. Muscle Nerve. 1997 Dec. 20(12):1477-86. [Medline]. Chang MH, Lee YC, Hsieh PF. The real role of forearm mixed nerve conduction velocity in the assessment of proximal forearm conduction slowing in carpal tunnel syndrome. J Clin Neurophysiol. 2008 Nov 6. [Medline]. Lee D, van Holsbeeck MT, Janevski PK, et al. Diagnosis of carpal tunnel syndrome. Ultrasound versus electromyography. Radiol Clin North Am. 1999 Jul. 37(4):859-72, x. [Medline]. Tai TW, Wu CY, Su FC, Chern TC, Jou IM. Ultrasonography for diagnosing carpal tunnel syndrome: a meta-analysis of diagnostic test accuracy. Ultrasound Med Biol. 2012 Jul. 38(7):1121-8. [Medline]. Cartwright MS. Ultrasound of focal neuropathies. Walker FO, Cartwright MS, eds. Neuromuscular Ultrasound. Philadelphia, Pa: Elsevier Saunders; 2011. 74-76. Banta CA. A prospective, nonrandomized study of iontophoresis, wrist splinting, and antiinflammatory medication in the treatment of early-mild carpal tunnel syndrome. J Occup Med. 1994 Feb. 36(2):166-8. [Medline]. Page MJ, O'Connor D, Pitt V, Massy-Westropp N. Therapeutic ultrasound for carpal tunnel syndrome. Cochrane Database Syst Rev. 2012 Jan 18. 1:CD009601. [Medline]. Ugurlu U, Ozkan M, Ozdogan H. The development of a new orthosis (neuro-orthosis) for patients with carpal tunnel syndrome: its effect on the function and strength of the hand. Prosthet Orthot Int. 2008 Dec. 32(4):403-21. [Medline]. Marshall S, Tardif G, Ashworth N. Local corticosteroid injection for carpal tunnel syndrome. Cochrane Database Syst Rev. 2007. (2):CD001554. [Medline]. Carpal Tunnel Syndrome: Physical Therapy or Surgery?. J Orthop Sports Phys Ther. 2017 Mar. 47 (3):162. [Medline]. [Full Text]. Scholten RJ, Mink van der Molen A, Uitdehaag BM, et al. Surgical treatment options for carpal tunnel syndrome. Cochrane Database Syst Rev. 2007. (4):CD003905. [Medline]. Boya H, Ozcan O, Oztekin HH. Long-term complications of open carpal tunnel release. Muscle Nerve. 2008 Nov. 38(5):1443-6. [Medline]. Verdugo RJ, Salinas RA, Castillo JL, Cea JG. Surgical versus non-surgical treatment for carpal tunnel syndrome. Cochrane Database Syst Rev. 2008 Oct 8. CD001552. [Medline]. de Krom MC, Kester AD, Knipschild PG, et al. Risk factors for carpal tunnel syndrome. Am J Epidemiol. 1990 Dec. 132(6):1102-10. [Medline]. Atroshi I, Gummesson C, Johnsson R, et al. Prevalence of carpal tunnel syndrome in a general population. JAMA. 1999 Jul 14. 282(2):153-8. [Medline]. [Full Text]. de Krom MC, Knipschild PG, Kester AD, et al. Carpal tunnel syndrome: prevalence in the general population. J Clin Epidemiol. 1992 Apr. 45(4):373-6. [Medline]. Goga IE. Carpal tunnel syndrome in black South Africans. J Hand Surg [Br]. 1990 Feb. 15(1):96-9. [Medline]. Garland FC, Garland CF, Doyle EJ Jr, et al. Carpal tunnel syndrome and occupation in U.S. Navy enlisted personnel. Arch Environ Health. 1996 Sep-Oct. 51(5):395-407. [Medline]. Durkan JA. The carpal-compression test. An instrumented device for diagnosing carpal tunnel syndrome. Orthop Rev. 1994 Jun. 23(6):522-5. [Medline]. Kao SY. Carpal tunnel syndrome as an occupational disease. J Am Board Fam Pract. 2003 Nov-Dec. 16(6):533-42. [Medline]. [Full Text]. Palmer KT, Harris EC, Coggon D. Carpal tunnel syndrome and its relation to occupation: a systematic literature review. Occup Med (Lond). 2007 Jan. 57(1):57-66. [Medline]. Bernard PB, ed. Musculoskeletal Disorders and Workplace Factors: A Critical Review of Epidemiologic Evidence for Work-Related Musculoskeletal Disorders of the Neck, Upper Extremity, and Low Back. National Institute for Occupational Safety and Health. Jul 1997. Available at http://www.cdc.gov/niosh/docs/97-141/. Fernandez-Munoz JJ, Palacios-Cena M, Cigaran-Mendez M, et al. Pain is Associated to Clinical, Psychological, Physical, and Neuro-physiological Variables in Women with Carpal Tunnel Syndrome. Clin J Pain. 2015 Apr 15. [Medline]. Zagnoli F, Andre V, Le Dreff P, et al. Idiopathic carpal tunnel syndrome. Clinical, electrodiagnostic, and magnetic resonance imaging correlations. Rev Rhum Engl Ed. 1999 Apr. 66(4):192-200. [Medline]. Incebiyik S, Boyaci A, Tutoglu A. Short-term effectiveness of short-wave diathermy treatment on pain, clinical symptoms, and hand function in patients with mild or moderate idiopathic carpal tunnel syndrome. J Back Musculoskelet Rehabil. 2014 Jul 24. [Medline]. Page MJ, O'Connor D, Pitt V, Massy-Westropp N. Exercise and mobilisation interventions for carpal tunnel syndrome. Cochrane Database Syst Rev. 2012 Jun 13. 6:CD009899. [Medline]. O'Connor D, Page MJ, Marshall SC, Massy-Westropp N. Ergonomic positioning or equipment for treating carpal tunnel syndrome. Cochrane Database Syst Rev. 2012 Jan 18. 1:CD009600. [Medline]. Goodyear-Smith F, Arroll B. What can family physicians offer patients with carpal tunnel syndrome other than surgery? A systematic review of nonsurgical management. Ann Fam Med. 2004 May-Jun. 2(3):267-73. [Medline]. [Full Text]. Meys V, Thissen S, Rozeman S, Beekman R. Prognostic factors in carpal tunnel syndrome treated with a corticosteroid injection. Muscle Nerve. 2011 Nov. 44(5):763-8. [Medline]. Chen PC, Wang LY, Pong YP, Hsin YJ, Liaw MY, Chiang CW. Effectiveness of ultrasound-guided vs direct approach corticosteroid injections for carpal tunnel syndrome: A double-blind randomized controlled trial. J Rehabil Med. 2018 Feb 13. 50 (2):200-8. [Medline]. [Full Text]. Raeissadat SA, Shahraeeni S, Sedighipour L, Vahdatpour B. Randomized controlled trial of local progesterone vs corticosteroid injection for carpal tunnel syndrome. Acta Neurol Scand. 2017 Feb 22. [Medline]. Eftekharsadat B, Babaei-Ghazani A, Habibzadeh A. The Efficacy of 100 and 300 mg Gabapentin in the Treatment of Carpal Tunnel Syndrome. Iran J Pharm Res. 2015 Fall. 14 (4):1275-80. [Medline]. [Full Text]. Hui AC, Wong SM, Leung HW, Man BL, Yu E, Wong LK. Gabapentin for the treatment of carpal tunnel syndrome: a randomized controlled trial. Eur J Neurol. 2011 May. 18 (5):726-30. [Medline]. [Guideline] American Academy of Orthopaedic Surgeons. Management of carpal tunnel syndrome: evidence-based clinical practice guideline. Available at https://www.aaos.org/uploadedFiles/PreProduction/Quality/Guidelines_and_Reviews/guidelines/CTS%20CPG_2.29.16.pdf. Feb 29, 2016; Accessed: May 23, 2018. Rivlin M, Kachooei AR, Wang ML, Ilyas AM. Electrodiagnostic Grade and Carpal Tunnel Release Outcomes: A Prospective Analysis. J Hand Surg Am. 2018 Jan 31. [Medline]. Rozanski M, Neuhaus V, Thornton E, Becker SJ, Rathmell JP, Ring D. Symptoms During or Shortly After Isolated Carpal Tunnel Release and Problems Within 24 hours After Surgery. J Hand Microsurg. 2015 Jun. 7 (1):30-5. [Medline]. Pace GI, Zale CL, Gendelberg D, Taylor KF. Self-Reported Outcomes for Patients Undergoing Revision Carpal Tunnel Surgery With or Without Hypothenar Fat Pad Transposition. Hand (N Y). 2017 Mar 1. 1558944717701243. [Medline]. Sensory nerve conduction studies from the left hand of a patient with a several-year history of numbness and weakness (responses from the median nerve in the right hand were completely absent). Note marked slowing of the conduction velocity (CV) to 29.8 and 25.5 m/s for digits 3 and 1, respectively (normal >50 m/s). The amplitude for both also is reduced markedly (normal >10). These findings are consistent with carpal tunnel syndrome. Motor nerve conduction studies from the left hand of a patient with a several-year history of numbness and weakness (responses from the median nerve in the right hand were completely absent). Note that the conduction velocity (CV) across the carpal tunnel segment slows severely to 18.3 m/s (normal >50 m/s) and that the distal motor latency is prolonged at 6.3 ms (normal &lt; 4.2 ms). Amplitudes are low for the wrist and elbow stimulus sites at 4.7 mV (normal >5 mV), but amplitudes are 31% higher distal to the carpal tunnel (at the palm). This discrepancy may represent conduction block (neurapraxia) at the level of the carpal tunnel or coactivation of the ulnar branch to adductor pollicis. Needle electromyography is required to determine whether axonal loss is present.